When I last delved into the cherry-scented- butter-flavored-with-earthy-undertones world of wine applications for the iPhone and iPod touch, I confessed that although I may not be Robert Parker, I know what I like. 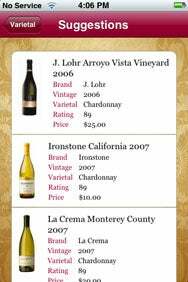 Fact is, for the expert or even the well-versed amateur, the App Store offers oenophiles ample utilities to keep tabs on their cellars, create wish lists of their favorite vintages, or review and share their latest tasting adventure in Sonoma or Napa. That’s all to the good. More power to them. But what of the novice? The tyro? The overwhelmed rank amateur who wouldn’t know a cabernet franc from a Welch’s grape soda? For that luckless soul, there is Wine101 by FuzzyBeta. This $3 app is wine for the uninitiated. When you launch Wine101, you will see a list of names for red wine. The simple menu at the bottom of the screen lets you choose among red and white wines, and food. The graphics are pleasing and the type is easy to read, although not adjustable. You tap on a varietal and the app pops open a window detailing where the grape comes from, how the wine smells and tastes, and what foods it might pair with. These tend to be broad generalizations. Not all chardonnays, for example, will smell of apple, peach, apricot, mango, banana, oak, smoke, toast, cream, acacia, butter, cocoanut, tangerine, hazelnut and yeast. But all will have one or more of those elements. Wine101 is simple and pretty to look at. Too simple. You don’t get much in the app for the price. It needs more. 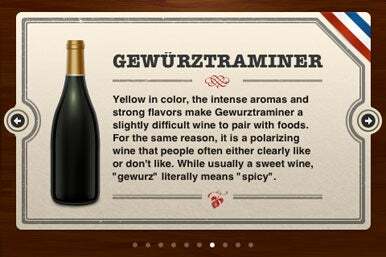 For example, the app could use a pronunciation key because, yes, there are people who do not know how to properly pronounce “shiraz” or “gewürztraminer.” There isn’t a word to be found in Wine 101 about sparkling wines or champagne. And the food pairings section refers to wines, such as white grenache, sherry, chenin blanc, Cotes du Rhone and Beaujolais, for which the app offers no additional information or explanation. I’m left with the impression that Wine 101 is a work in progress, a vintage that could use a bit more time to mature. One of the trickier feats, at least as far as I’m concerned, is finding the right wine to go with a meal. The wine journals reliably inform us that the old rules no longer apply. You may drink red wine with fish. You may drink champagne with red meat. It’s okay. Well, no, actually it’s not OK. It’s bloody confusing. My rule is: When in doubt, go with a zinfandel. But it isn’t necessarily so. Hello Vino by Drive Thru Interactive, Wine & Dine by Halev Solutions, and Vino for Dinner by VinoforDinner.com each offer apps that aim to demystify the age-old dilemma of delectable food and wine pairings. Each app has peculiar strengths and weaknesses. A, B, or C: Vino for Dinner gives you multiple choices for your food and wine pairings. But if the three options aren’t available, you need to keep looking. The $3 Vino for Dinner has a slick interface that is a bit too reminiscent of an Olive Garden menu. You can choose from meat, seafood, poultry, pasta and cheese for pairings. Tap poultry, for example, and you can then choose from chicken, turkey, or duck. The app then lists options for preparation and spices. So grilled duck will usually call for a pinot noir or a merlot, while a duck served with cream sauce might go well with a chardonnay. Tap on the varietal, and Vino for Dinner will suggest specific labels and years. The upside of Vino for Dinner is the app’s emphasis on wines that retail for less than $30 a bottle and that are available widely in stores. The downside is the app will only recommend three wines at a time. Maybe three is enough, but if they’re the wrong three—if those three, for some reason, aren’t on your store’s shelf or on the restaurant’s list—then you’re on your own. 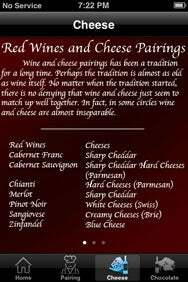 Say Cheese: If a cheese plate is on your menu, turn to Wine & Dine for an extensive list of cheese-friendly pairings. The app also takes into account the user’s expertise. 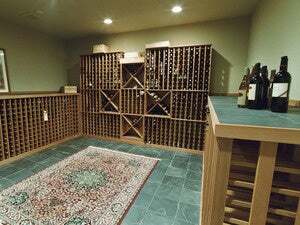 Do you consider yourself a wine novice, a beginner, a casual drinker, a knowledgeable sipper, or a master oenophile? Wine & Dine will also make recommendations based on whether or not you like your wine to have a higher alcohol content. Wine & Dine is loaded with information about certain varietals, but offers no specific recommendations. So you will learn, for example, that “Chardonnay is the most sought-after white wine on the market today,” and that “some Californian wineries have tarnished California’s Chardonnay image by producing quick and inexpensive Chardonnay in order to fill consumer lust for any wine labeled Chardonnay.” But Wine & Dine won’t tell you which wineries to seek out or avoid, making the app of lesser value when you are trying to decide on a bottle at the store or at a restaurant. Like Vino for Dinner, the free Hello Vino also requires Internet access to take full advantage of its features. But Hello Vino wins for its graphically appealing interface and the sheer volume and diversity of its recommendations. Unlike Wine101, Hello Vino includes a pronunciation key. The app helps you find wine by food pairing, occasion, taste or style, and country or region. It’s one of the friendliest and least forbidding of the wine applications I’ve encountered. It presents choices as questions, rather than faits accompli. The Gift That Keeps on Giving: Among Hello Vino’s many charms is a feature that makes recommendations if you’re giving wine as a gift. Above all, the app is thorough. Having pizza for dinner? Hello Vino is the only app among these three that lists pizza as a pairing option. It will ask if you’re having cheese, pepperoni, chicken, veggies, white sauce or—my personal favorite—ham and pineapple and make a recommendation accordingly. Looking for a gift idea? Hello Vino will offer different recommendations for a boss, co-worker, birthday present, housewarming gift, wedding, or the ever-popular holiday Yankee Swap. One unfortunate drawback with Hello Vino is the clumsy and counterintuitive way the app incorporates social media. Sure, you can “share” a wine-pairing discovery with your pals on Twitter, Facebook, MySpace or with the wider world on Digg. But unlike other apps, which auto-generate a message for you to post with a couple of taps, you actually have to log in to Twitter or Facebook from the app and type out a Tweet or a Wall post. Who needs that kind of aggravation? If the developers fix the sharing component of this app, Hello Vino is a top-tier utility without question. It’s still very good without the social media tools, however.